Joni in the Spotlight Stamping: COLORING DOWN THE "ROSIE" LINES! It's that time again!! Time for another Coloring Down the Lines Blog Hop!! Woohoo! You may be hopping on over from Helen's blog! I love her Rose Red Christmas card!!! So pretty! If you're just dropping by, hope you'll come back! Now most people are in the holiday spirit right now! With Thanksgiving in 2 days, Christmas is just behind!!! And let's not forget this year's Hanukkah "miracle"-falling on Thanksgiving! Very cool!!! But I digress! It would seem like it would be easy to come up with a Christmas card, but these colors don't really shout out "Christmas"!! After a bit of hair-pulling, I had fun with this one! I decided to go with the snowflake theme! 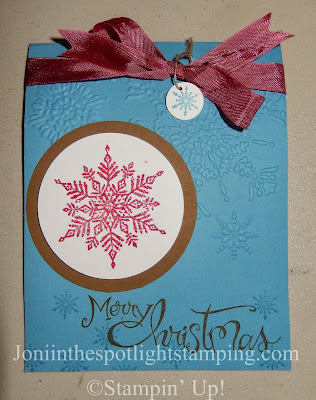 Love that Snowflake Embossing Folder! Very pretty!!! 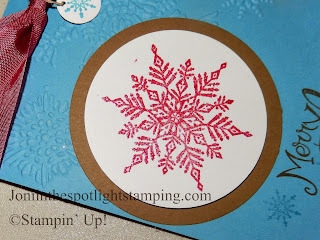 I used the beautiful snowflake from the Best of Snow stamp set! (Only 1 more Best of...stamp set for the 25th Anniversary! :( ) The sentiment is Sassy Salutations, and the little snowflake is from the Hostess set from the Holiday Catalog, Warmth & Wonder. It was embossed with Irredescant Ice Embossing Powder. Just enough "bling"! The ribbon is a bit of retired Rose Red Seam Binding. Not sure why it's retired tho! Hmmm. Well, used it anyway! lol Works with the card! So time to hop on over to Liz's blog & see her Christmas creation with Rose Red!! Can't wait! I just want to wish everyone a wonderful Thanksgiving, and as I think about all the things I am thankful for, I'm sure to include all of you-my blog friends! Blessings to you & yours!